As a constantly broke and always hungry college freshman at UC Irvine, most of my meals consisted of campus dining via my meal plan or the Jack in the Box dollar menu that seemed to only offer chicken sandwiches (with American cheese ONLY) whenever it was my turn to order. 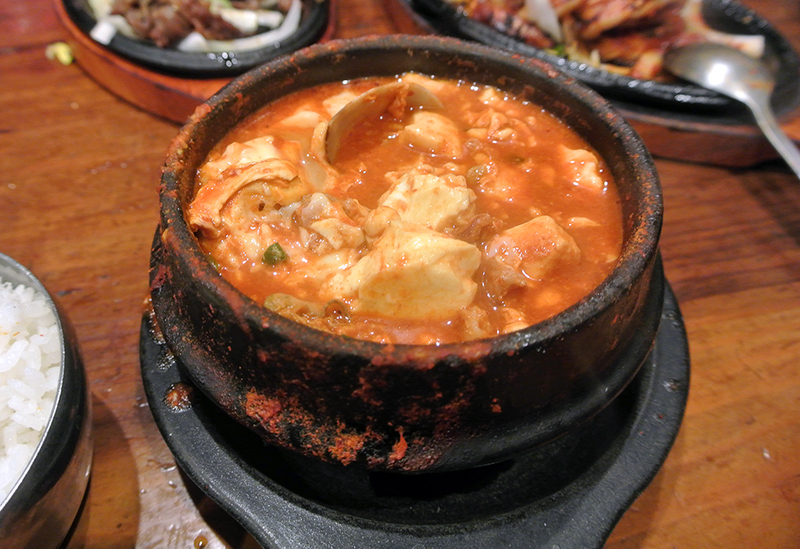 After one too many late night trips to the drive-thru, one of my suite mates suggested switching it up by going to eat Sundubu jjigae, promising to be our guide for the Korean tofu stew that none of us had ever heard of. I don’t remember exactly what restaurant we ate at that day, but I do recall the mesmerizing bubble of the fiery-red liquid laced with uncurdled tofu, bits of meat, and various seafood, and how it was a whole lot better than anything else I had been eating. It’s been a favorite comfort dish of mine ever since (especially when the temperature dips, although it’s still reaching into the 80s here in early November), and fortunately nearby Koreatown has an abundance of options to satisfy my cravings. Beverly Soon Tofu is the gold standard when it comes to soon tofu in Los Angeles, with over twenty years in operation and claiming to be the first to bring the dish to the city. Situated in the bottom corner of a two-story strip mall, it stands out among all of the other businesses with its red awning and crowds of hungry customers waiting for one of the wooden tables inside to open up. Parking can be a hassle even with the cheap valet, but a little bit of patience will usually yield a spot on Olympic or one of the side streets. Inside, two motherly Korean women do just about everything aside from the cooking by taking orders, serving food, clearing tables, and always making sure to stop at your table long enough to crack a raw egg into your awaiting soup. The menu is pretty straight forward, with ten different flavors of soup and a handful of other Korean dishes that can be ordered individually or as part of a combination (with a smaller, though still filling, portion of soup). 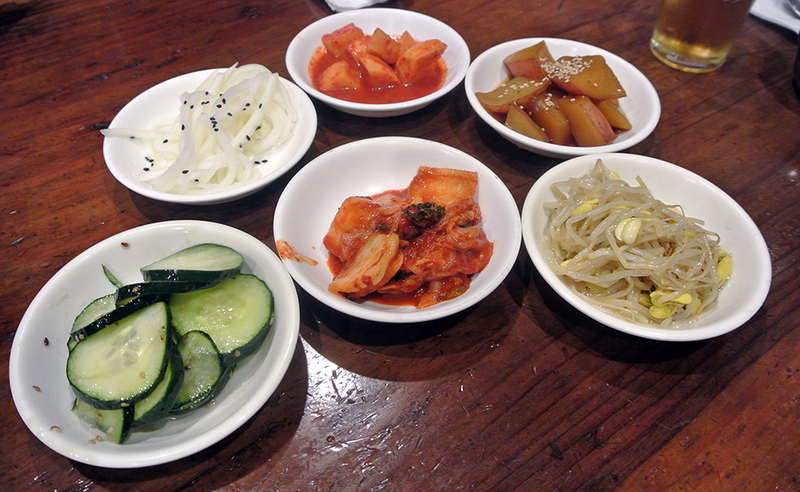 As with any true Korean restaurant, a proper banchan arrived as an appetizer/side dish meant to be eaten throughout the meal. We had two types of kimchi, slices of crisp cucumbers, bean sprouts, pickled daikon with black sesame seeds, and chopstick-tender potatoes with a sweetened soy sauce. All of them were particularly refreshing in between bites of the main dishes, and were quickly refilled when requested. 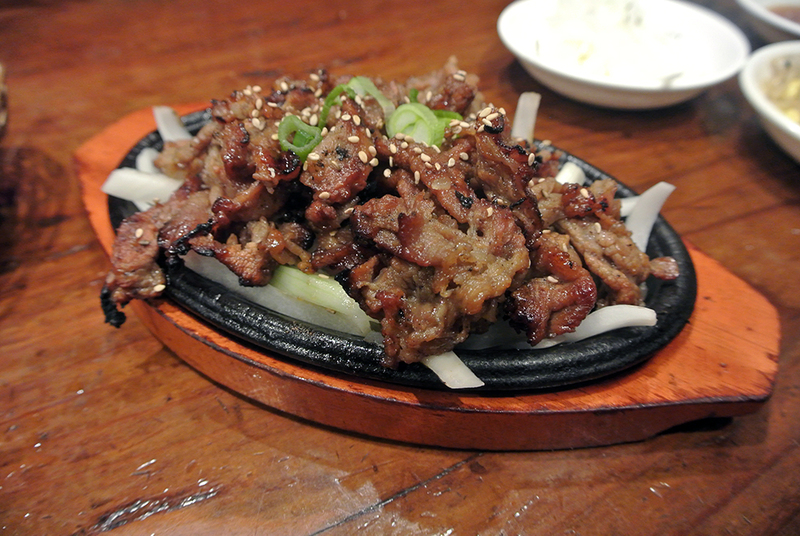 The bulgolgi from my combination came out next with thin strips of beef sitting atop a bed of onion slices laid out on a sizzling stone plate. The meat was tasty and not chewy in the slightest, and displayed a bit of sweetness from the marinade. The onions got better and better as they continued cooking from the heat of the plate until caramelized. 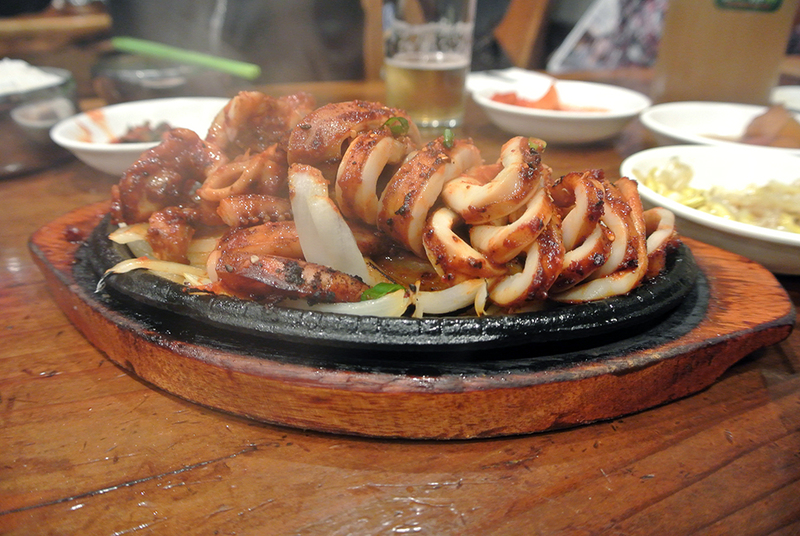 We also had an order of spicy squid after being enticed by pictures of the cephalopod displayed around the restaurant and on the menu. I didn’t find it to be all that spicy with what seemed to be a light coating of the red pepper paste gochujang. The rings were satisfyingly tender while the tentacles had some chewiness to them, a nice contrast of textures with each bite. 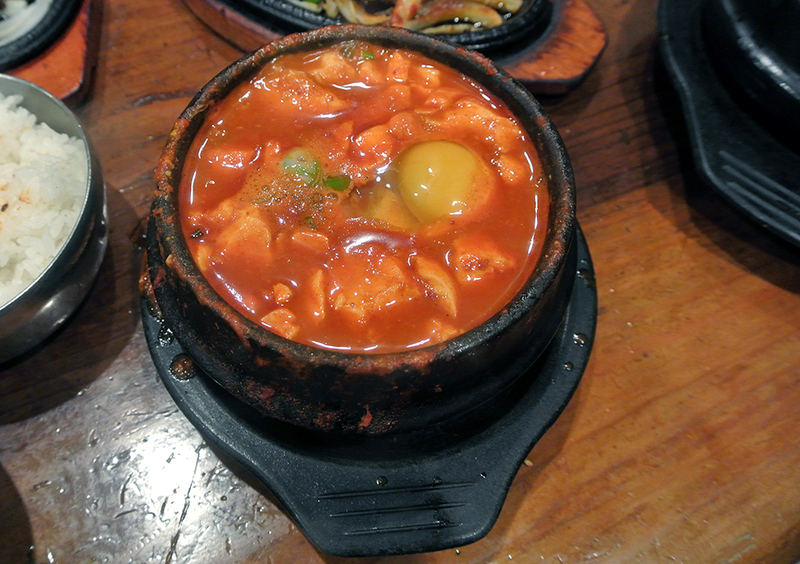 Finally, the main attraction was placed in front of us, a stone bowl overflowing with a steamy, lava-like stew. Then, with one hand, the waitress cracked an egg directly into the pot, the yellow yolk briefly visible before being mixed in with everything else. With a few swirls of my spoon, globs of soft tofu were brought to the top, along with pieces of pork, an oyster, and a few clam shells. The broth was concentrated, clearly made from scratch and slowly cooked for hours, and brought an immediate inner warmth after only a couple of bites. Eaten with the steamed rice served alongside it, the soon tofu had the comforting quality generally found in a home cooked meal, exactly what I was looking for. With two decades of serving Sundubu jjigae under their belt, Beverly Soon Tofu has to be Los Angeles’ number one destination for the tofu stew. Though the other Korean offerings like the bulgolgi and spicy squid didn’t exactly stand out on their own, they were decent enough in complimenting the namesake dish that is seen on every single table. Don’t let the long waits during peak hours deter you because this stew is too good to pass up.